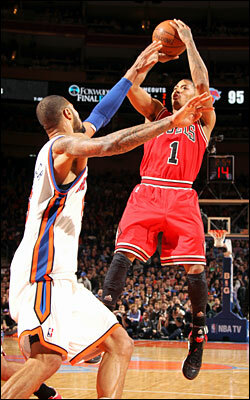 Derrick Rose’s first game back from missing 12 in a row with a groin injury didn’t start out like he planned. The reigning NBA MVP was limited to only seven points in the first half as the Knicks sprinted out to a 27-6 lead during Sunday’s afternoon game at Madison Square Garden. The Bulls chipped away at the deficit and even held a 10-point lead with three and a half minutes to go in the fourth quarter, but four straight missed free throws in the final minute of regulation cost Chicago the game. So while the good news for the Bulls is that they don’t have to wait long for a rematch—the Knicks are in town Tuesday for an 8:30 p.m. tipoff—the bad news is they could be without Rose, who tweaked his right ankle during Sunday’s contest and is listed as a game-time decision. Rose told reporters following the team’s Tuesday morning shootaround at the Berto Center that there is some swelling and some pain from the injury, which Rose believes occurred when he came down from a shot and stepped on Landry Fields’ foot. But Knicks coach Mike Woodson said his team will be prepared in the event he’s ready to go. If Rose is in the lineup, Knicks rookie Iman Shumpert will again carry part of the burden of trying to slow him down, something he was effective in doing at times on Sunday. According to one ESPN New York account, Shumpert was on Rose for 10 of his 26 shots, with Rose connecting on only two of those attempts and also committing seven turnovers. Rust may have also contributed to Rose’s slow start, but regardless, Shumpert is earning a name for his defensive prowess. Carmelo Anthony, who scored a season-high 43 points on Sunday and made the game-winning three with eight seconds left in overtime, agreed. Drafted with the 17th overall pick of the 2011 NBA Draft, Shumpert said former Knicks GM Donnie Walsh told him to expect the task of guarding players like Rose and Miami’s Dwyane Wade if he was selected by the Knicks. Walsh is no longer with the organization, but Shumpert has more than embraced the challenge thus far. “He’s starting to accept his role on this basketball team as being one of our best defenders, taking pride in it and going up against the best two guards out there every night,” added Anthony of Shumpert. Whether Shumpert gets another shot at defending Rose on Tuesday remains to be seen. A determination on Rose’s status for tonight won’t likely be made until at least 90 minutes before tipoff. And while clearly having their starting point guard in the lineup will help the Bulls get back at the Knicks, both teams are more concerned with the big picture. Chicago currently holds the NBA’s best record at 43-14. With a mark of 29-27, New York is tied with the Philadelphia 76ers for the seventh spot in the Eastern Conference. Thus, there is a chance the teams could meet again in the postseason. If that happens, the Knicks believe Sunday’s game is an indication they’ll be ready. Woodson, now 11-3 since taking over coaching duties for Mike D’Antoni, liked what he saw from his team early in the game on Sunday. Although the Knicks blew the early 21-point lead, they fought back late in the fourth quarter to force overtime and ultimately win. “I don’t like being down, but I love it when our team fights back,” said Woodson. “We were down 10 with three minutes on the clock. We could have folded the tent and went home. But we didn’t do that. To me, that’s a sign of a team that’s hungry and trying to make the playoffs, trying to move up in the standings.